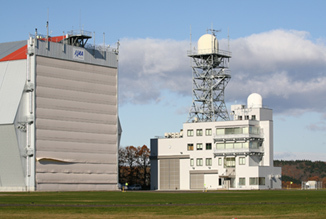 Taiki Aerospace Research Field, which is a base for cooperation between the town of Taiki, Hiroo-gun in Hokkaido and JAXA, is located in the Taiki Multi-Purpose Aerospace Park. The Field has a 1,000-meter long runway and large airspace and various flight tests to confirm the accuracy of achievements and safety issues to apply the results of research on aerospace technology. There is a flight test building to control the operations of test aircraft and to process flight test data. Station-keeping flight tests of the stratospheric platform (SPF) were performed from 2001 to 2004. For these tests, JAXA's hangar, flight control tower, and weather observation facility were built. From 2008, scientific balloon-borne experiments that used to be performed at Sanriku Balloon Center (1971 - 2007) in Ofunato-shi, Iwate Prefecture, will be performed at the Taiki Aerospace Research Field, where other space scientific experiments are also conducted. For scientific balloon-borne experiments, various falicities and equipments are necessary: a control center, a handing area, a sliding launcher for a balloon, a weather observation equipment and so on. The Balloon Operation Building was constructed in 2008. The four story building has an assembly chamber to prepare scientific balloons and instruments, a control room to release a balloon safely, an operation room to track a flying balloon and recieve telemetry data of experimental data, and so on. Parabora anntenas with 3.6m and 2m diameter are euippted on the roof to track a flying balloon. Marine surveillance radar is also equipped for safety when a balloon releases and fall on the sea.